It’s the eve of 2013 and today I was discussing with my partners leveraging my skill and expertise as a designer dressmaker to secure space for Tibiae Tech… Ironically yesterday I posted an excerpt from the memoir of Elizabeth Keckly; the dressmaker and designer of the first lady’s gown at Lincoln’s second inauguration! Her joy at being free struck me! She used her skill to secure the freedom and that of her son. It’s a New Year … getting a new attitude is tougher this time around! there seems to be so much to do. Today as in the days before emancipation, the days before desegregation, Blacks with skills use it to the benefit of their family and community! It is a legacy I know too well and often admittedly sometimes resent! Dealing with this community is not easy…. but I was born free, I am educated and trained. I have no excuse! On the 150th anniversary of Watch Night, we should gather in churches, synagogues, mosques and in not so secret locations recognizing and commemorating those men and women of faith who gathered on December 31, 1862, to watch for the opportunity to secure the blessings of liberty for themselves and their posterity under the banner of the U. S. Constitution. 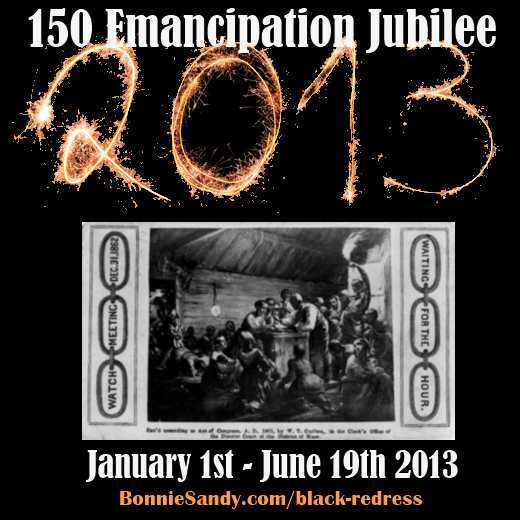 Indeed, on the 150th anniversary of the Day of Jubilee, we should celebrate when the war to preserve the Union officially became a war to end slavery, thus recognizing the efforts of Americans of African descent who freed themselves by helping to save the Union. Posted in Uncategorized and tagged Black Redress, Holiday 2012.